I have a 3rd generation 15GB iPod (with Dock connector). 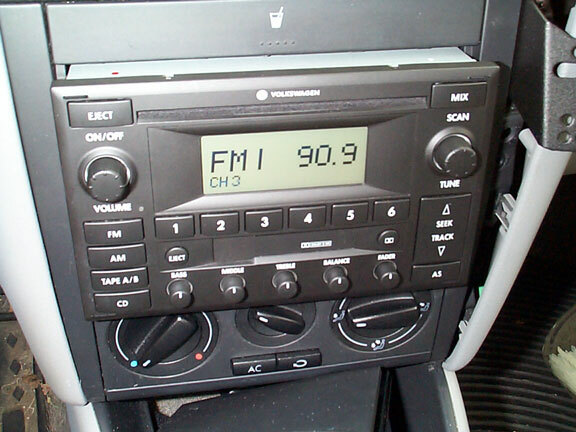 The OEM head unit is a double-din model with single CD and Cassette player, called "US Premium 6" on the label. Enfig and Radio Shack are the sources for all the parts of this project. I based most of this DIY off of a post on the VWVortex Jetta/Golf MKIV forum. The original thread is hiding somewhere; at least I can't find it. Thankfully 'Texer Nebulight still has it up on his website here. Many, many thanks. 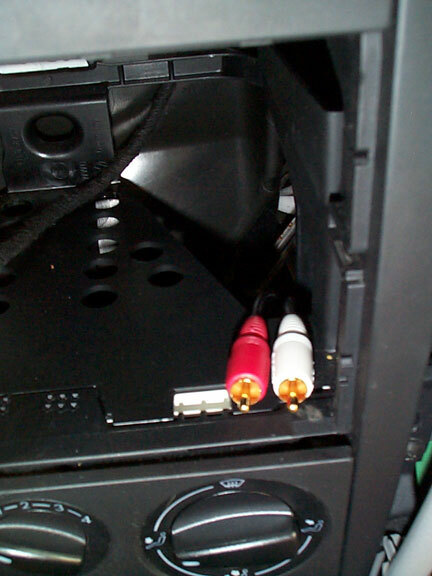 I originally bought the parts for this install in August 2004 but finally got around to the install in August 2005. First, disconnect the NEGATIVE terminal of the car's battery. BE CAREFUL. So here's where it begins. 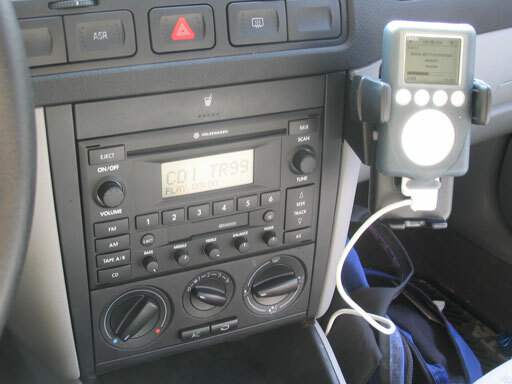 Back when I bought the car I removed the stock head unit and replaced it with an Aiwa CDC-MP32. The Aiwa unit slid right out. The DIN slot was a little tougher, but it came out pretty easy too. I then removed the sleeve that held the Aiwa unit in place, disconnected the harnesses and wires. 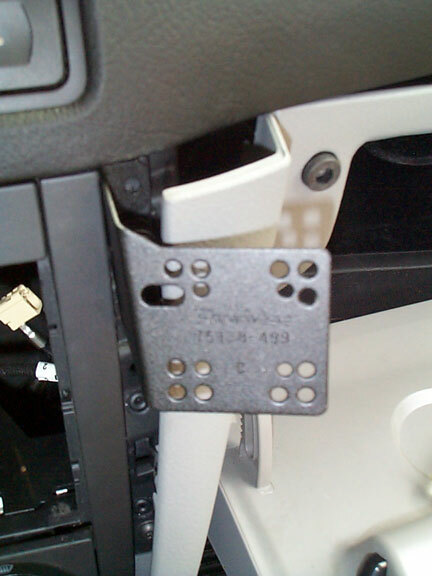 First, per the included instructions, I removed the 3 T20 torx screws at the bottom of the glove box. 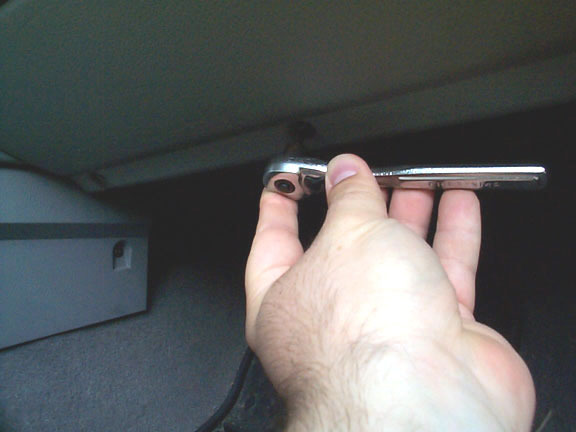 Next, open the glove box door and remove the 3 T20 torx screws there. 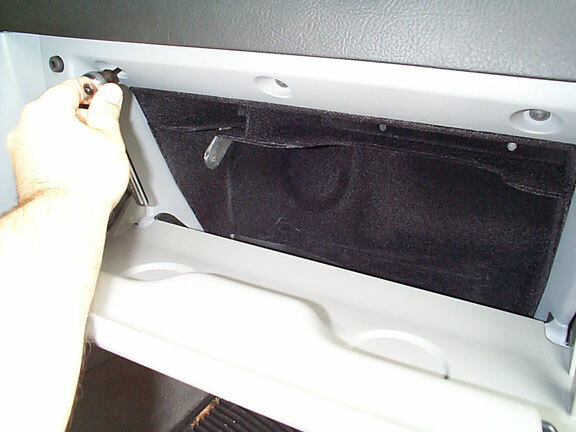 The glove box will then need to be pulled forward and to the right a bit. Here is a view of the left side of the glove box. The 2 tabs need to be carefully pulled out. I used a screwdriver to gentlypry the glovebox trim from the dash. The tabs came right out. Again, be careful not to mar the trim around the stereo. 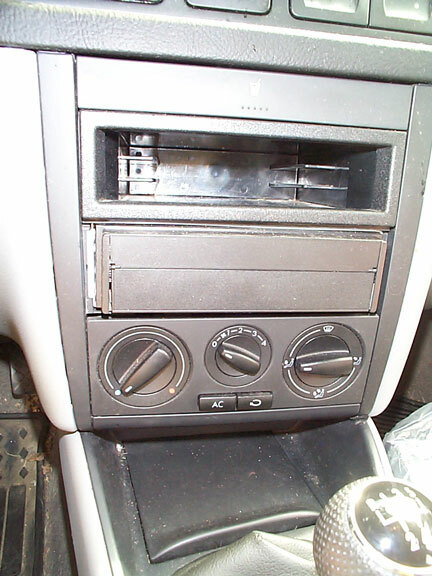 Here's a wider shot showing the loosened glove box. 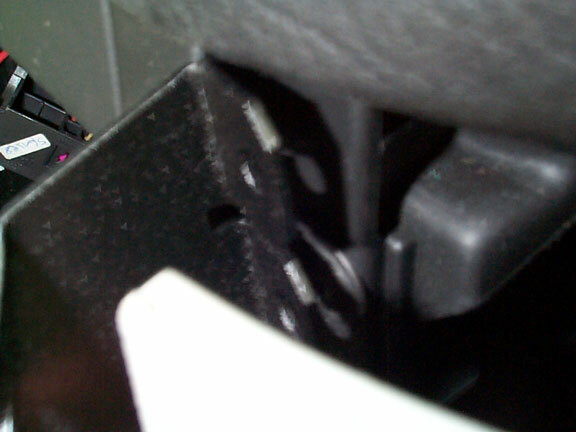 The glove box doesn't need to come all the way off, just enough to gain access to the torx screws, as seen here. Here I ran into my first real issue. The InDash mount that I have (which is spec'd out for my car) doesn't fit where it should due to a small triangular plastic tab that sticks out (seen in the center of the photo). It's there to asist in holding the glovebox trim in place, although not an essential piece, it will need to be removed if you are going to install the PanaVise InDash mount! Here's a closeup of the InDash mount. You can see how it won't fit because of the small triangular plastic piece. I simply scored the tab with a knife and used needle nose pliers to snap it off. Simple. 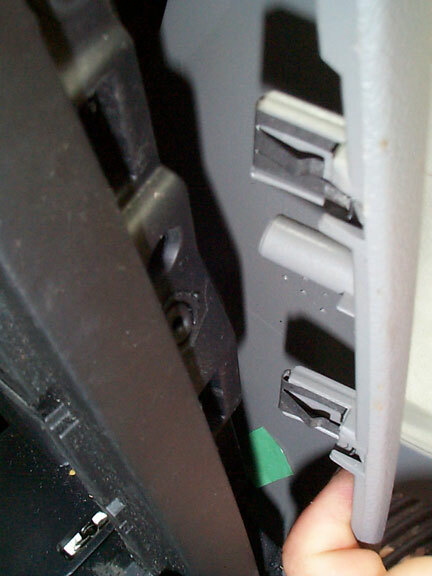 Next, remove the T20 torx screw from the top of the trim area, just below the little triangular plastic tab. Put the InDash mount in place and tighten the lower screw. It's a very very tight fit and I had a hard time doing this. I actually finished up the job by using a screwdriver to hold the T20 bit against the screw and using needle nose pliers to tighten the screw. This is definitely one of the hardest parts of the install. Next, use a 3/32 drill bit and drill a pilot hole for the top screw through the large hole in the InDash mount. Then insert the included self-tapping philips head screw and tighten down. That's it! To give me a little room to work, I unscrewed the T20 torx screw on the center console trim below the glove box on the passenger side. This allows me to get in there a little easier to fish the wires through. Next I needed to remove the ash tray assembly. This was pretty easy. First, open the sliding door and remove the red tray. Then, unscrew the screw at the base of the assembly. 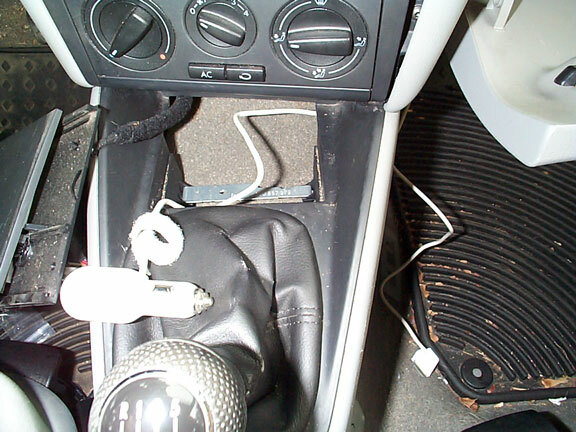 Next simply lift the end nearest to the gear shift up and out. 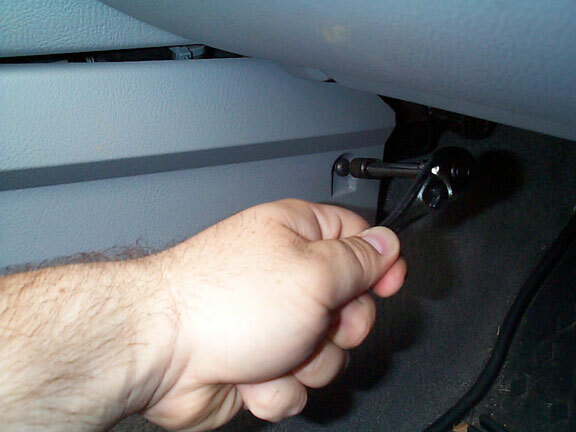 Carefully pull the unit up and out, massaging the wires out of the way as you lift (It's a tight squeeze). 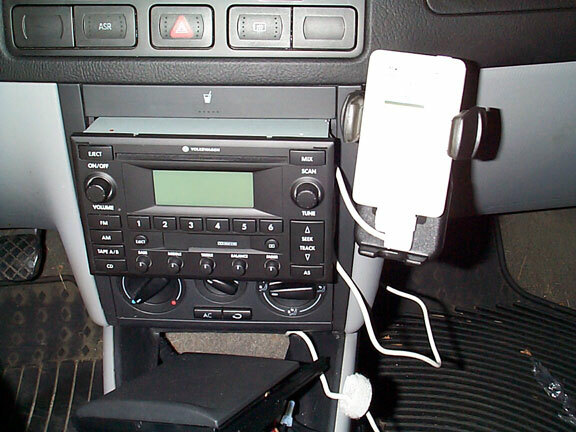 I spent a long time contemplating where I'd like the wires to exit the dash and run to my iPod. 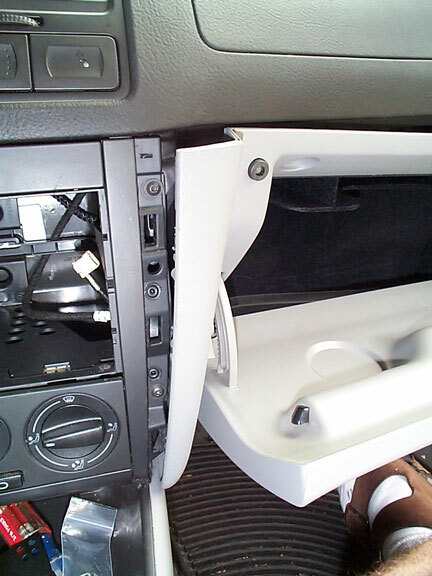 Some folks have drilled holes (which must be large b/c they have to accomodate the iPod plug), others have removed the light in the glove box and let them feed through the hole (leave the light out, I guess??). 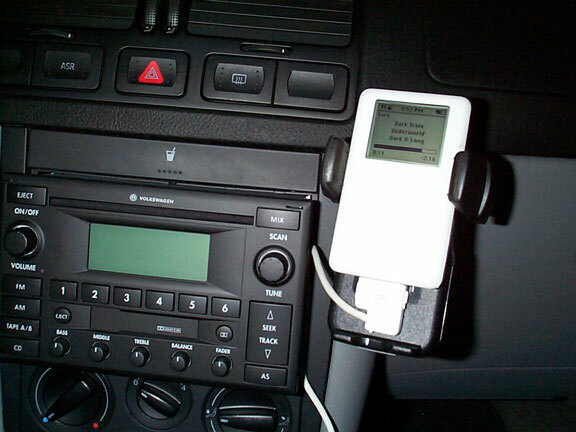 Still more folks have done custom installs of an iPod Dock. I really didn't want to drill any holes and wanted somthing that was simple so if I ever wanted/needed to remove/replace the unit, I could do that easily. 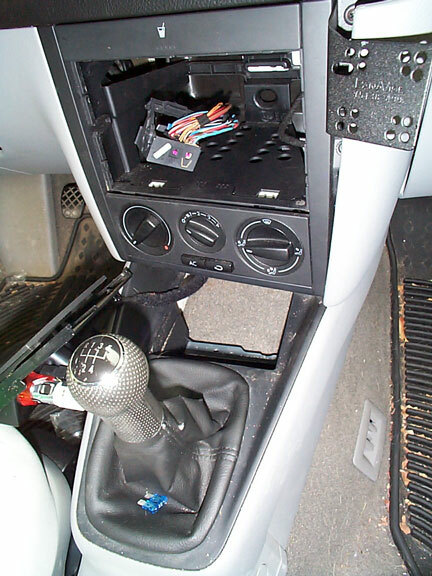 So, I chose to run the cable between the two pieces of trim beneath the center dash console (next to the AC controls). The wire snakes between the two pieces of plastic and exits to the right. It gives me some play room, which is nice, and hangs nicely, out of the way, on my InDash mount when not in use. 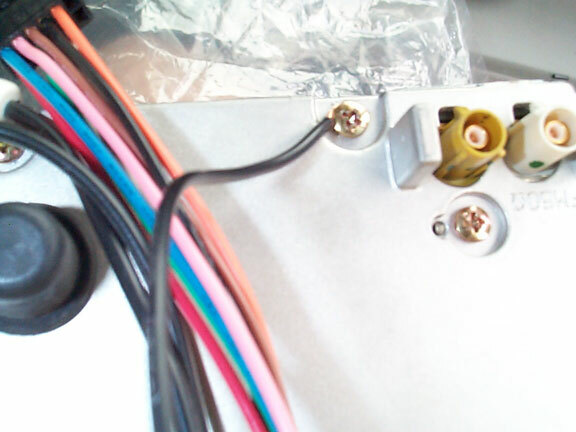 I will probably add a piece of tape or plastic tubing around the cable where it passes between the trim pieces, as it is tight and will probably, over time, damage the cable. To get an idea of the location, look at this picture from above. F8V7058-APL. 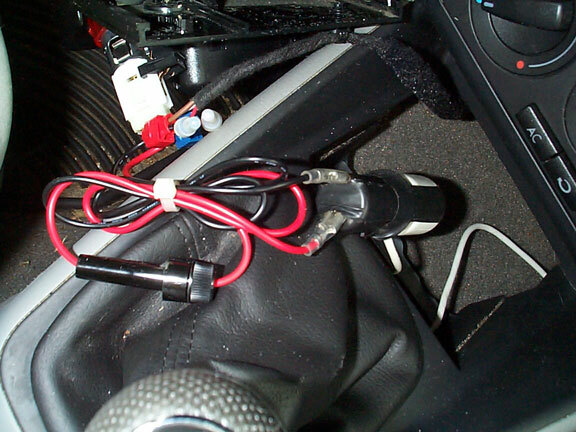 Power for the Auto Kit is from a Radio Shack 12VDC Car Power Adapter Outlet which is tapped into the vehicle's 12V power supply. 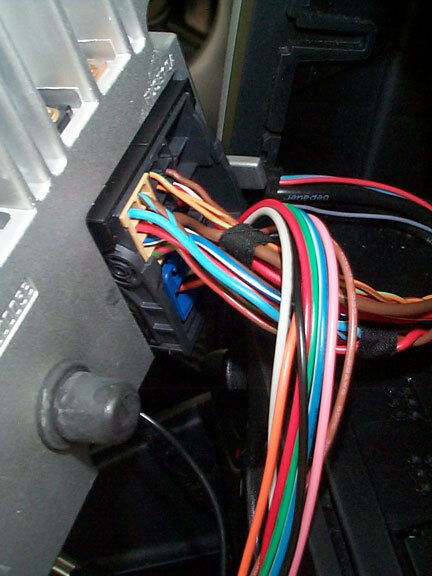 I chose to use suitcase connectors to tap the wires going into the 12V socket in the ash tray. The ends of the Adapter Outlet are capped. Here are the two installed suitcase connectors. The BROWN wire coming from the socket in the ash tray is the Ground. The center RED wire is the Positive wire. 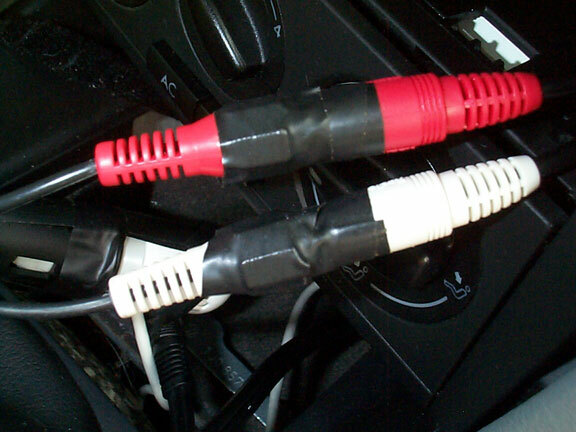 Next, I inserted the Belkin Auto Kit into the Radio Shack Outlet and used some electrical tape to strap it into the outlet. I don't want this thing wiggling loose under the dash somehow. A cable tie to tidy up the leads to the Radio Shack Outlet. I left the fuse out so it could be replaced. I purchased a Radio Shack 3' Gold Series Stereo Cable, model 42-2550 (dual RCA - 1/8" Stereo MiniPlug) to run from the Auto Kit to the BlitzSafe adapter. 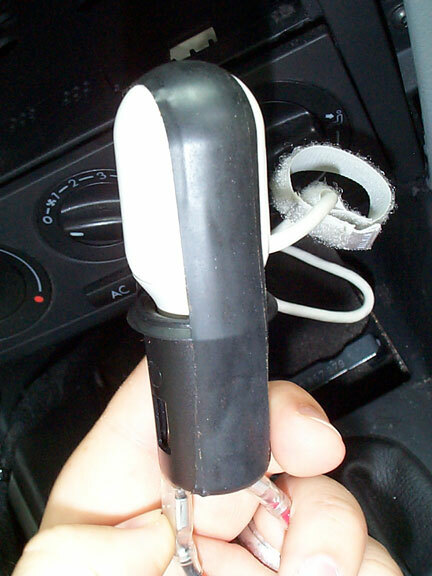 I used a piece of tape to hold the plug into the Auto Kit to keep it from wiggling loose. The BlitzSafe VW/AUX DMX V.5 is an awesome little gadget. 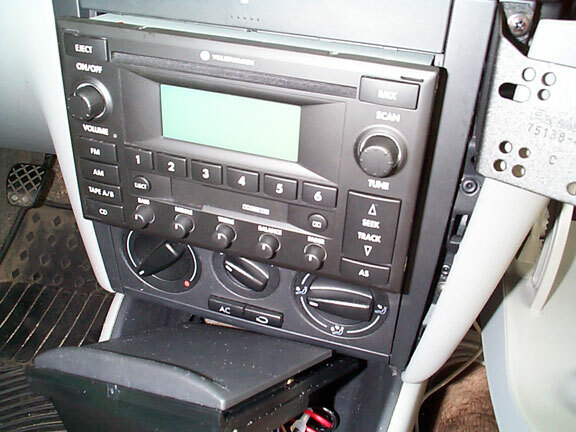 It basically tricks your OEM head unit (and others) into thinking a CD Changer is installed. 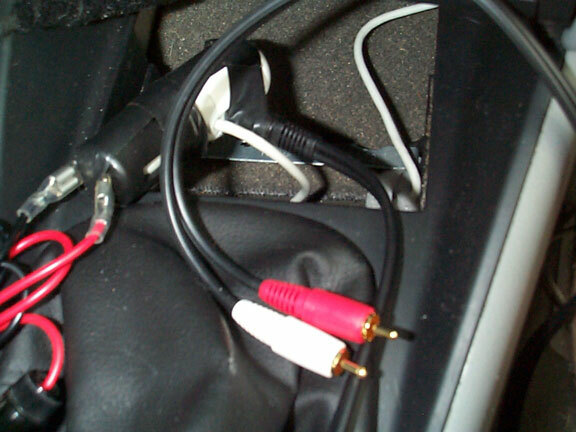 When you click your CD Changer button on the head unit, the BlitzSafe adapter functions as the CD Changer but instead you have a set of female RCA plugs to hook up whatever you want! 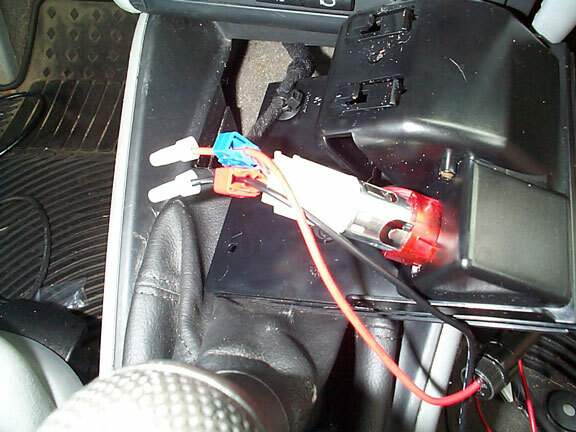 First, I attached the GROUND wire from the BlitzSafe adapter to the rear of the head unit. 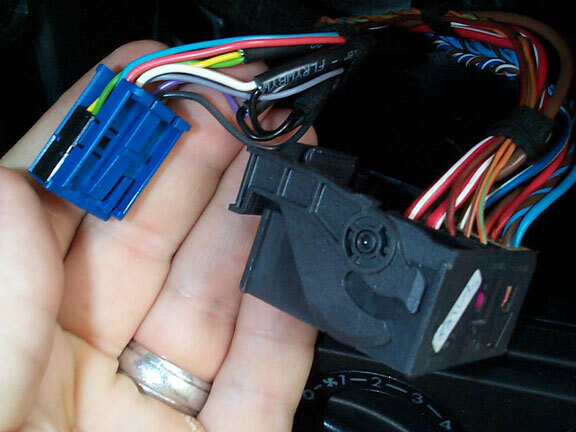 The connector that comes attached to the BlitzSafe unit is way to large for any screw on the back of the head unit, so I removed it, stripped the end of the wire and ran it under a screw on the head unit (seen here). 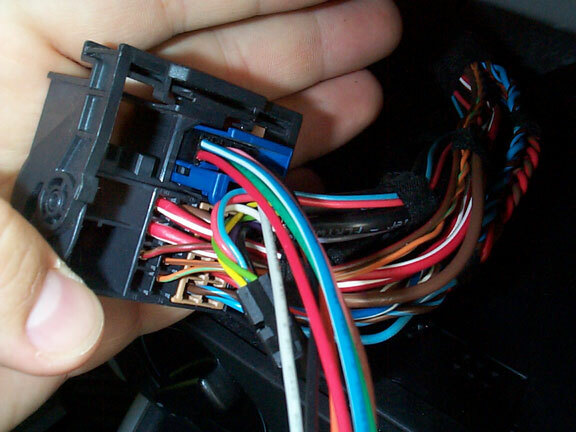 The instructions recommend that you use a suitcase connector to attach it to the OEM head unit GROUND wire, but at the risk of damaging the wire, I opted not to do that. Here we go hooking the BlitzSafe up to the OEM harness. First, we must remove the blue harness from the larger black harness. This is easily done by pressing the release tab on the blue harness. Next, slide the black plug out of the harness to the side. There is a release tab on the side. Next, simply insert the identical plug from the BlitzSafe adapter into the blue harness. It only goes in one way, so don't worry about putting it in backwards. Reinsert the blue harness into the black harness and you're done. 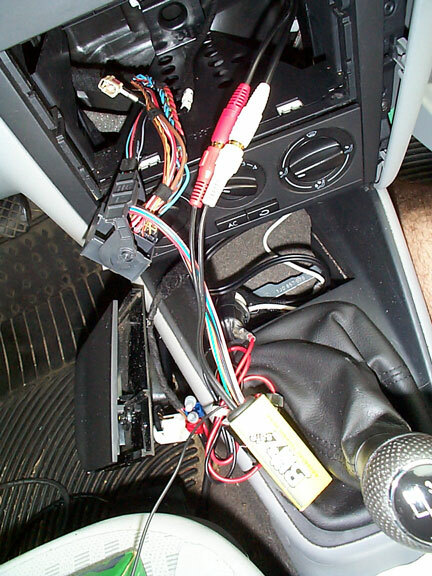 Here are the male RCA plugs coming from the Belkin Auto Kit up the right side of the dash and into the radio compartment. These connect to the BlitzSafe unit. Here you see where I snaked them up from below. Connect the RCA cables to the BlitzSafe adapter. This overall view shows you most of the components all hooked up. 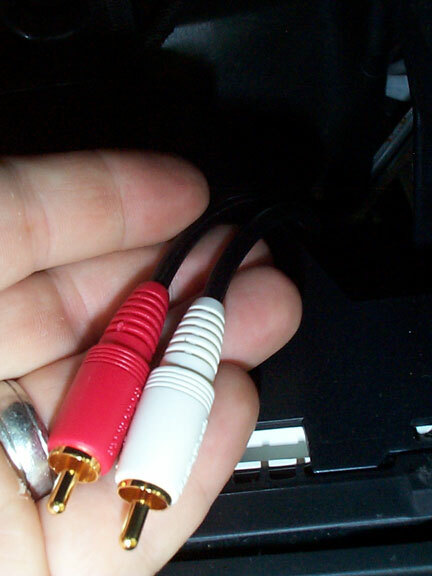 I added some electrical tape to the RCA connections once again to prevent them from wiggling apart over time. 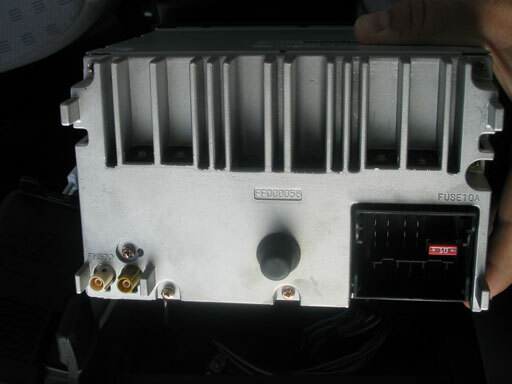 Now that everything is connected, slide the OEM unit partially in and get ready to test the system. Reconnect the NEGATIVE terminal on the car battery. It's alive! I had gotten an unlocking code from the VW dealership, just in case I needed it (it's supposed to be in your VW Owner's Manual, but if you're like me the salesperson forgot to write it in there). I didn't. 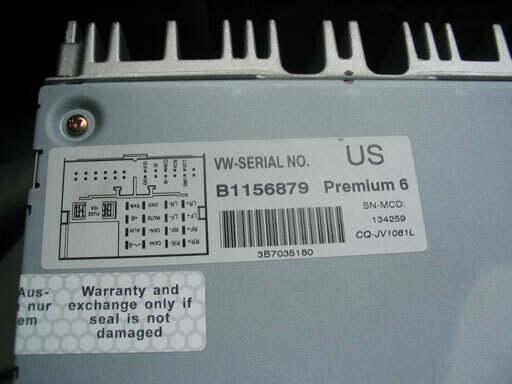 Once connected the OEM unit came to life. 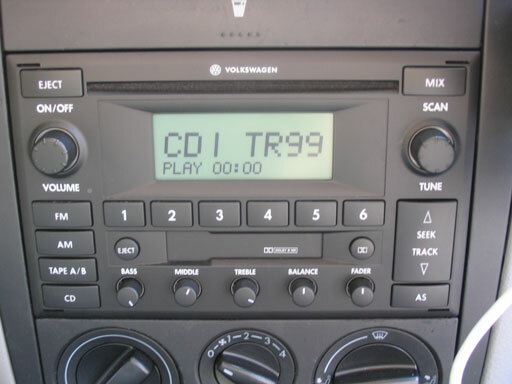 I clicked the CD button on the OEM head unit until the display read "TRACK 99" which indicates the BlitzSafe adapter is working. hooked up my iPod, got power, and clicked play when I ran into my second problem. No audio from the Right side! I troubleshooted the unit by switching the RCA plugs and like I thought, the problem was in the BlitzSafe unit; signal was coming through both Left and Right, but not passing through the BlitzSafe unit. Well, thankfully I purchased this unit from Enfig and after I sent an email explaining the situation they immediately responded that I send it back for a replacement! HOORAY FOR ENFIG! They rule. Even though I didn't finish today, I took a shot of a near-complete install. Stay tuned for more! So, back to completing the installation. First thing to do was to remove the head unit and get the info off the box for reference. Here's the top. 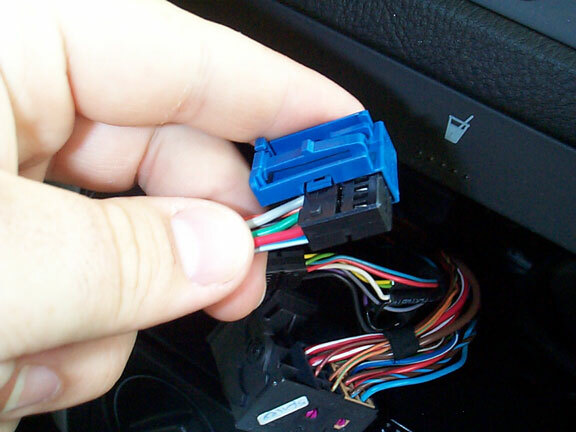 Another note: Something that I thought I would need in this install was an "Unlocking Code" for my head unit. 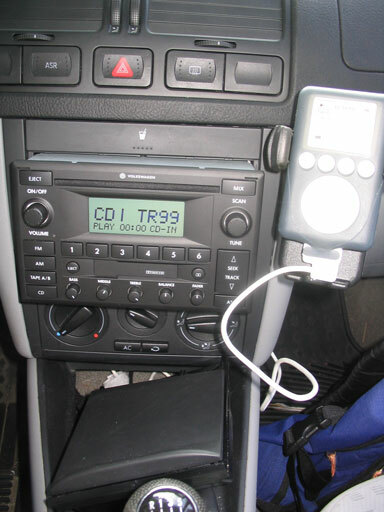 As I understood it, the code was needed any time the HU was removed from the car (read, unplugged) and then reinstalled. The dealer forgot to write it in my user manual so I had to call them to get it (I had to pry a bit; apparently they're not supposed to give it out over the phone, but the cool guy I spoke with understood and hooked me up). Well, when it came time to reconnect my factory head unit I did not need it at all. The thing powered right up and even rememebered the FM programmed stations I'd set over 2 years ago when I removed it to install the Aiwa CDC-MP32. Very cool. So, now that everything is hooked up and works great, I have to get the HU back into the DIN slot and close up the ash tray compartment. This proved to be a lot harder than I thought. The wires coming from the BlitzSafe adapter and the harness coming off the back of the HU are really big and there is not a whole lot of room behind the HU. Some wiggling and pushing and I eventually got it to lock into place. The ash tray was really tricky too. I managed to scratch some trim a bit during the install. 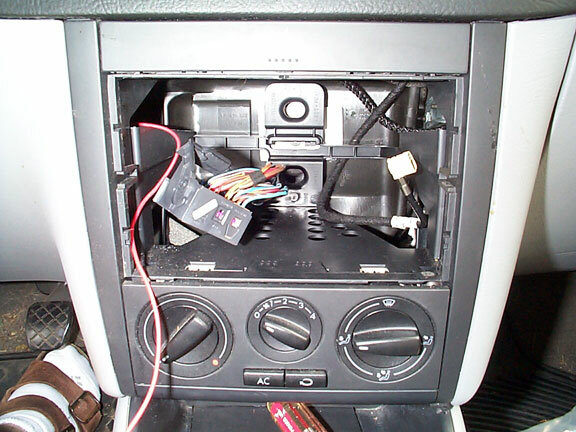 With the new wires tapped into the 12V port in the ash tray, it is a very tight squeeze to get it back into the slot. 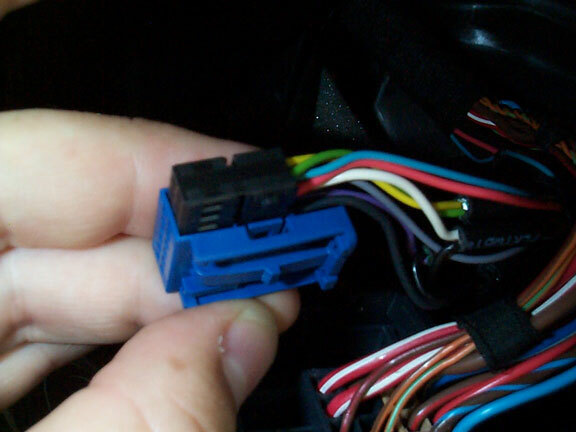 I had to sort of bend the harness of the 12V port a bit and slide it in. The trick is to push it way in, down and then toward you. This is because there are two hooks that clip onto the metal bar below the ash tray. You have to get it around the metal bar in order for it to close properly. 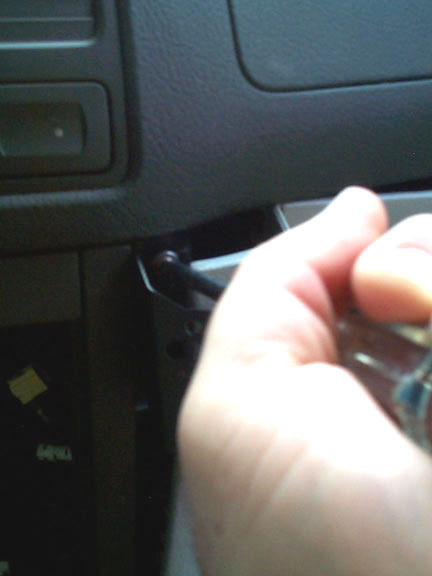 Tighten the screw which secures the ash tray to the metal bar and you're all done. So here it is all set up and running. The sound is fantastic. I love it so much more than the Aiwa unit; much crisper and cleaner. I also like having the OEM controls back. Very pleasing. Closeup on the iPod in the PortaGrip. 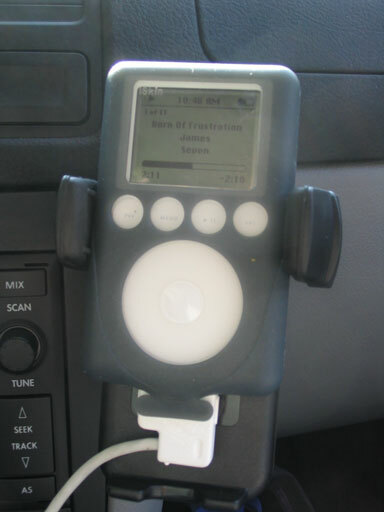 I have an iSkin eVo case on my iPod which makes the rubber "fingers" of the PortaGrip work very nicely. I don't have to squeeze them too hard and the iPod "floats" above the bottom of the PortaGrip unit so the iPod is not resting on the power plug. This is important b/c with all the vibration, if it was resting on the power plug it could damage the port on the iPod. If you have any questions, comments or thoughts, please don't hesitate to email me at the address below.